I hinted about a grown up version of the Modkid Malibu in my last post. Well, now I'd like to formally introduce you to the Malibu Misses. First let's talk options. The Modkid Malibu Misses features either a short or maxi skirt. If you opt for the maxi length, there are instructions for a single or double side slit(s). Patty went into detail to offer length guidelines for petite, average, and tall heights, but there are also instructions for creating the skirt tailored to your own measurements. Now, I absolutely love the cross-back, but there is also a full back option to give you a basic tank style dress. In case you are wondering, the back has enough coverage to conceal a racer-back bra. Thank you for that attention to detail!! I threw on a skinny belt for this last photo just to see how I'd like it. I think this would be such a great look for a full back maxi!! 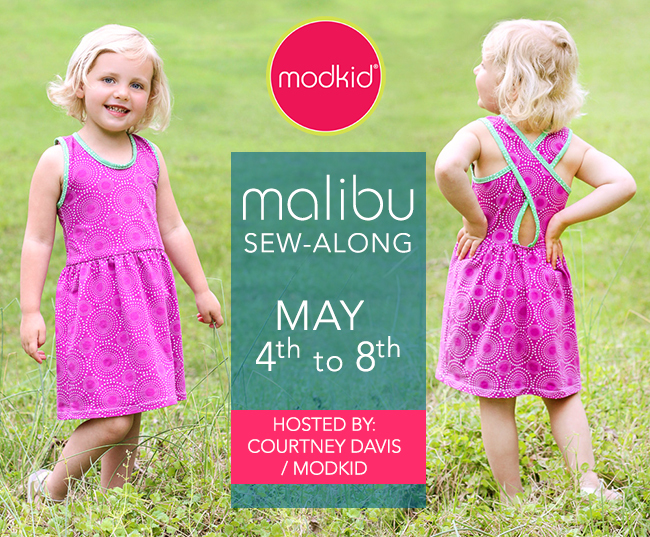 Finally, we announced a sew-along for the girl's version of the Malibu on the Modkid blog yesterday. If you like Mommy and Me sets, this is a great way to get started!